A new air filter may be able to kill bacteria and viruses floating in the air in the blink of an eye. The device uses ‘non-thermal plasma’ (NTP), a gas which causes molecules to react with oxygen to create ozone. Ozone is known to be anti-bacterial and destroys pathogens by rupturing their cell walls. But a new study found NTP also kills viruses and could destroy 99.9 per cent of them in a quarter of a second. Researchers hope this will one day put a stop to the spread of airborne infections, such as measles. 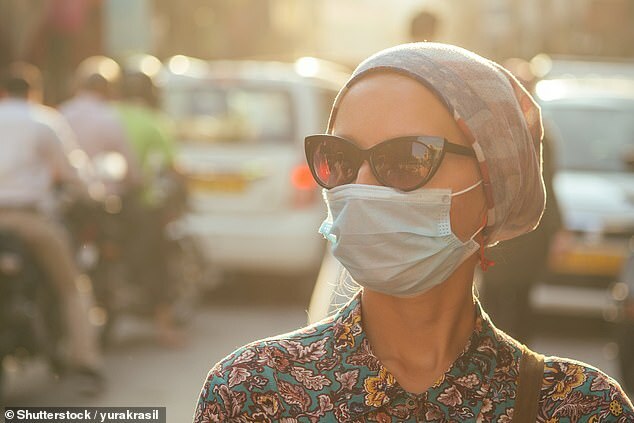 They are looking to alter the technology from being something that protects the air of a building to a device ‘you can wear’ to ‘replace traditional face masks’. The research was carried out by the University of Michigan and led by Tian Xia, a research fellow in the department of civil and environmental engineering. Outbreaks of airborne infectious diseases can cause serious alarm, the researchers wrote in the Journal of Physics D: Applied Physics. And ventilation systems, such as air-conditioning units, allow the pathogens behind these deadly outbreaks to spread easily between humans and animals. ‘Some viruses can survive for several kilometres in air,’ study author Dr Herek Clack, research associate professor, said. Non-thermal plasma (NTP), which is ‘like a flame without the heat’, has been shown to be effective against air-borne bacteria. WHO IS MOST AT RISK OF MEASLES? Everyone has a slight risk of developing measles because being vaccinated does not guarantee full immunity. However, unvaccinated young children are particularly at risk, as well as pregnant women who have not had the jab. Measles is common in many developing countries, particularly parts of Africa and Asia. More than 95 percent of measles deaths occur in countries with low average incomes. Outbreaks can be particularly life-threatening in countries experiencing or recovering from natural disasters or conflict. Damage to health services disrupts routine immunization, while overcrowding greatly increases the risk of infection. One study even found it can eliminate up to 95 per cent of E.coli bacteria in just ten seconds, Science Alert reported. NTP is a gas that mainly stores its energy in free electrons, which keeps its temperature low. Electrons are negatively charged particles of an atom. When pure oxygen is fed through a NTP emitting-device, it produces an effect similar to that of static electricity. These tiny sparks of ‘electricity’ are captured by glass beads in the structure’s pipes. ‘In those void spaces, you’re initiating sparks,’ Dr Clack said. This results in electrons being released from the NTP and atoms being discharged from their molecules. All this leads to the production of free radicals – oxygen molecules split into atoms. Oxygen radicals react with normal oxygen molecules at room temperature to form ozone, which is a known anti-bacterial substance. Within minutes, the ozone ruptures a bacteria’s cell wall, rendering it useless. And the new research shows NTP has a similar effect on viruses. The researchers subjected ‘viral aerosols’ to NTP, although it is unclear what the viruses were. They found the device ‘exponentially increased inactivation’ of the pathogen, which became greater as the air flow went higher. ‘By passing through the packed bed, pathogens in the air stream are oxidised by unstable atoms called radicals,’ Dr Clack said. The device works better, quicker and cheaper than air filters, Dr Clark added. ‘I really get excited about solutions to existing problems,’ he said. ‘The next phase will be human applications. How can we minimise what we do at a building scale down to the point where we get to a device that you can wear? The researchers claim the ozone exposure from the device is not a safety hazard due to it being within regulation standards. And ‘carbon-based ozone filters’ reduced the ‘residual ozone’ in some cases to ‘background levels’. The researchers are first testing the device at a pig farm to determine if it could prevent the spread of pathogens between livestock, which sometimes go on to infect humans.